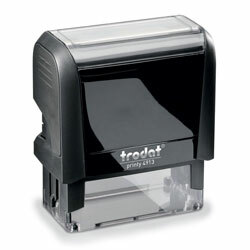 4-9/16" x 2-3/4" self-inking stamp with ergonomic handle and built in ink cartridge. Personalize with any text, logo or custom design you require at no additional cost. Create standard data tables that allow space for initials for quality control procedures at your production facility, processes in your accounting department, or, include a decent sized logo for impressions. This stamp is eco-friendly, climate neutral and sustainable. 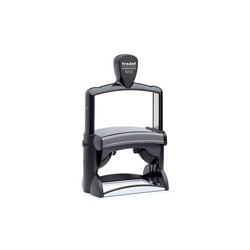 It includes a durable steel core that ensures a high quality product. No separate ink pad is required. 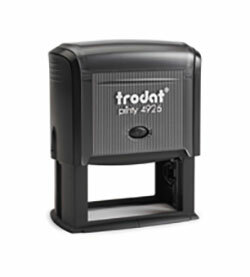 Trodat 4913 Custom Text Stamp - Max Plate Size - 2-3/8" x 7/8"
Text plate size of 2-3/8" x 7/8" perfect for a return address, a signature or a property of label for schools and medical organizations. 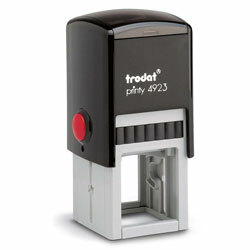 Trodat 4916 Custom Text Stamp - Max Plate Size - 2-3/4" x 3/8"
Self-inking stamp with text plate size of 2-3/4" x 3/8" ideal for banking or financial institutions. Trodat 4923 Custom Text Stamp - Max Plate Size 1-3/16" x 1-3/16"
Maximum text plate size of 1-3/16 x 1-3/16 and can be customized with any graphics or text you supply. These are the perfect solution for including logos/trademarks on handmade products, card making, marking invoices in an office setting and much more. 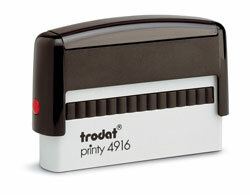 Trodat 4926 Large Custom Text Stamp - Max Plate Size 3" x 1-1/2"
A great option for large text. The print area measures 3" x 1-1/2" and can be customized with any company logo, artwork or text. Ideal for offices and production facilities when marking invoices and packages as RECEIVED, PAID, FRAGILE, etc.